Apricot oil or apricot kernel oil is obtained from the kernels or seeds of the apricot. The apricot tree or Prunus armeniaa belongs to the Prunus genus of the Rosaeae family and thought to have origins in China, Korea, and Japan. The scientific name is derived from Armenia but was present during ancient Greece and Rome. These beautifully orange colored fruits that are borne from the apricot tree are full of beta-carotene and fiber. 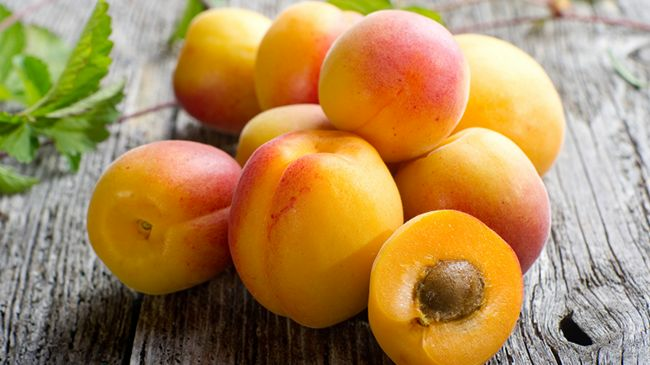 Apricots are small, golden orange fruits with velvety skin and flesh that is not overly juicy but smooth and quite sweet with a unique flavor of slight musk with a faint tartness. It is often consumed raw and used in juices, jams, jellies, chutneys, pastries, and pies. The large pit or kernel is where the oil is extracted through cold-pressing. The oil is light in color with a pleasant nutty odor commonly used in balms, creams, cosmetics, and lotions. What's in apricot seed oil? Apricot seed oil is rich in nutrients like proteins, soluble sugars, and fibers and unsaturated fatty acids like oleic and linoleic acid (Lee, H., Ahn, J., Kwon. 2014). The oil is rich in plant antioxidants as it is a good source of vitamins A and C but also have vitamins E, K, and even niacin. They have a huge mineral content including copper, magnesium, manganese, phosphorous and potassium. It has excellent softening and moisturizing properties that aid skin, scalp, and hair as it helps skin retain its elasticity and suppleness. With its natural anti-inflammatory properties it is often used to treat eczema and dermatitis, and when combined with St. John’s Wort it creates a soothing and cooling effect giving an even stronger anti-inflammatory effect. Apricot seed oil has oleic acid, which is an omega-9 fatty acid and a wonderful emollient that makes hair and scalp softer and more pliable. It actually moisturizes the hair and scalp while increasing the hydration level and reducing dryness. Linoleic acid benefits hair by stimulating hair growth while staving off moisture loss. Linoleic acid is a fatty acid that controls or keeps moisture in the hair and scalp. This makes it a favorite for hair sealants along with its pleasantly light scent. Massage your scalp to rid dryness to scalp and give a light scent soothing to the senses.